Part horror, part love story, part morality tale, Age Of Ultron is a smart superhero smackdown that raises the bar once more – this time it's personal, political and petrifying. The fan frenzy, smart marketing and merchandising around the Hulk-sized franchise that is the Marvel Cinematic Universe means sequel Avengers: Age Of Ultron would likely make a packet even if it solely consisted of the gang playing Marvel Super Heroes on Disney Infinity while eating Kellogg's Avengers fruit-flavoured snacks straight from the packet and wearing Avengers jim-jams lit only by an Age Of Ultron lamp for two-and-a-half hours. Fortunately, returning director Joss Whedon understands how to craft a superhero movie just as well as Marvel knows how to sell one. We rejoin the team mid-action as they tussle with HYDRA agent Baron von Strucker's (Thomas Kretschmann) men on a mission to retrieve Loki's stolen sceptre. It's an expert and epic sequence, a judicious use of slo-mo showcasing each Avenger's special skills whilst offering a lean recap of the main characters for anyone who's been under a rock since 2012's Avengers Assemble became the third-highest-grossing film of all time. It's the first of several impressive action set-pieces yet Avengers: Age Of Ultron also establishes itself as primarily concerned with the personal and the political – a superhero movie grounded in the real world, focused on family, ethics and psychology. So, following on from the extra-terrestrial threat of the Loki-led Chitauri and HYDRA's infiltration of S.H.I.E.L.D., the world is a bleak place, with Cap (Chris Evans) et al fearing for the safety of the human race. There's a fresh threat in the attractive but unnerving form of mysterious twins Pietro (Aaron Taylor-Johnson) and Wanda (Elizabeth Olsen) Maximoff, generic experiments harbouring a disturbing secret which has given them particular beef with Tony Stark (Robert Downey Jr). AOU is about hubris, it's Marvel's take on the Frankenstein story with unplanned-for Ultron as Stark's hideous progeny. He's a whip-smart, quip-smart, hyper-intelligent infant who takes after but hates his ersatz father so wants to rebel in the most dramatic way possible. James Spader, who provides Ultron's voice, is perfect, oozing intelligence and sophistication tinged with rage and righteous indignation. A megalomaniac who'll pause for a perfect one-liner to with which to wither Stark while destroying the rest of his race without a thought, he's a genius sociopath who mirrors his creator, Whedon's horror roots showing through magnificently as AOU becomes the first genuinely frightening entry in the franchise. The price, though, is a serious tone which differentiates the film from the rapid-fire funny Avengers Assemble and warmly anarchic Guardians Of The Galaxy. There are gags but AOU is tonally much closer to The Winter Soldier, laying ground for Captain America: Civil War, which promises to be darker still. The Maximoffs – soon revealed to be Quicksilver and Scarlet Witch – stay away from colourful spandex but carry an emotional heft. As opposed to X-Men: Days Of Future Past's cheeky, sneakered videogamer mutant (as played by Evan Peters), Taylor-Johnson's Quicksilver is serious and embittered while Olsen's Scarlet Witch plays more like a J-horror girl ghost than a superhero. High-flying synthetic being The Vision (voice of Jarvis, Paul Bettany, in a whole new role), meanwhile, is something else altogether. Six main Avengers, a handful of S.H.I.E.L.D mainstays and three flesh-and-blood newbies, not to mention a robot army, means it's already a battle for screen time, yet AOU still manages to be cameo-tastic, bringing back a host of favourites from previous stand-alone movies as well as some significant fresh supporting characters (including Andy Serkis as an arms dealer who's afraid of cuttlefish). And, somehow, it works. There's a love story, a tragedy, a shock reveal, eye-popping action, tear-jerking emotion and a crazy/creepy baddie who might possibly prove too much for younger viewers. And there's as much interior turmoil as external, as Hulk (Mark Ruffalo) and Black Widow (Scarlett Johansson) struggle with their pasts, Thor (Chris Hemsworth) wrangles his responsibilities and Hawkeye (Jeremy Renner) juggles his work/life balance. If there are problems, they're inherent to the genre. At 141 minutes it feels long, particularly in the final act which, as in almost every superhero movie, involves a massive (and impressive) extended battle sequence. 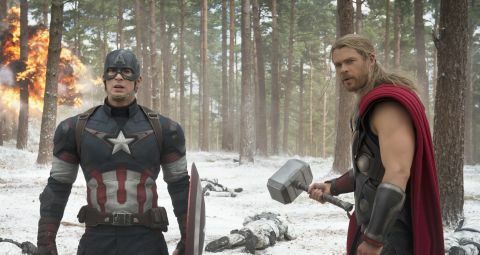 In short, Avengers: Age Of Ultron remains right at the top of its game. Forget the MCU, this is event cinema which puts Marvel right at the centre of our own, real-world cinematic universe.